The Clarksville Rotary Club, headed by organizer, Cheryl Moss, announces the 7th Annual Go Commando Half Marathon, 5K and Kid's Fun Run to be held at Old Glory Distilling Company. This unique fundraiser event includes a Shadow Run that occurs the same day with participation by US servicemen and women now serving in Afghanistan. Recognized as a nationally certified course, this year's Half Marathon and 5K course will take participants through gently rolling hills outside the city limits of Clarksville. The event begins at 7:30 a.m. and will have a four hour time limit for the half marathon. A Kids Fun Run will be held for children 10 years old and under. Parents and guardians are welcome, and can run free with their children. Old Glory Distilling Company is located at 451 Alfred Thun Road alongside Interstate 24 at Clarksville's Exit 4; not far from Fort Campbell where the 101st Airborne Division is based. Online registration will end on Wednesday, October 18 at 10:00 p.m. Runners may begin registering for the event online now, or sign-up in person at the Go Commando Health & Fitness Expo at Old Glory Distilling Company on Friday, October 20th from 11am to 7pm. Matt Cunningham, Old Glory's owner and distiller is proud to be part of such an important event to honor our country's service men and women. "This is an incredible event that we're once again glad to have here at Old Glory Distilling Co. We have a terrific venue that will be hosting the Health and Fitness Expo on Friday prior to the race day on Saturday. Saturday's run will be a big family friendly event with live music, food trucks, special edition craft cocktails, beer, games, and more." 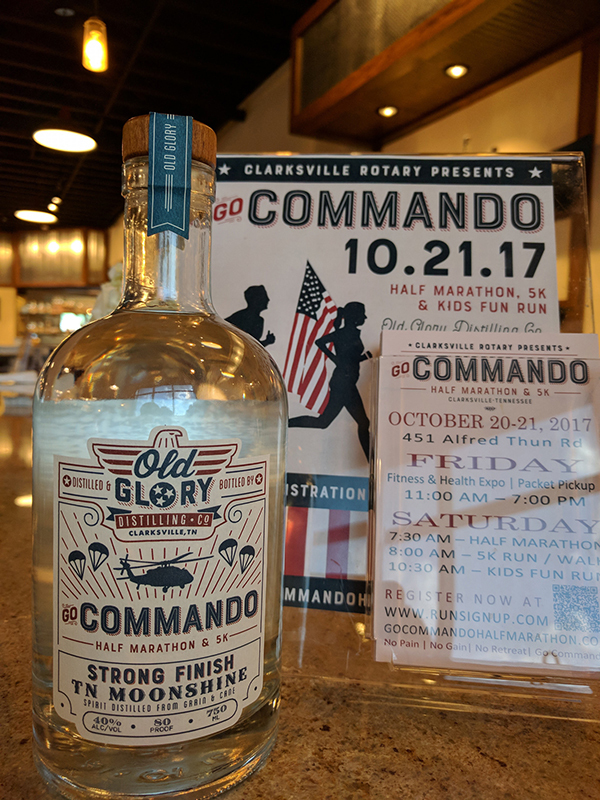 To commemorate the Go Commando Half Marathon and Shadow Run, Old Glory is releasing a limited edition "Strong Finish TN Moonshine." Bottles will only be available from the gift shop during Friday's Health and Fitness Expo and on race day. A portion of sales from each bottle sold will benefit the Clarksville Rotary Club. Event organizer Cheryl Moss says, "On behalf of the Clarksville Rotary Club, we are very excited to be returning to Old Glory Distilling Co. for our second year. I want to thank Matt and Old Glory Distilling Co. for their enthusiastic participation with this event. Proceeds from this year's Go Commando races will help fund The Rotary Field of Dreams, a specially designed, multipurpose baseball field and family playground designed to meet the unique requirements of our special needs athletes, families and support networks." Celebrating its 100th anniversary, the Clarksville Rotary Club is proud to continue a long tradition of supporting the local community. Scholarships to Austin Peay State University, the purchase of Rotary Park, construction funding of two local playgrounds and a splash pad at Heritage Park are just a few of the Club's many contributions. Moss adds, "Our goal is to make the Go Commando races a fun and exciting event for the whole family. This year, the 101st Airborne Division Band will be in attendance and we encourage friends and family to come out to hear the band and cheer on all of our participants." In addition to medals for runners, cash prizes will be awarded for the top three overall male and female in both the Half Marathon and the 5K, and top 3 overall in each age group and gender. For more information about the Go Commando Half Marathon and 5K, visit gocommandohalfmarathon.com.